The Smith Public Library has partnered with Murphy Middle School to review all of the Lone Star Nominees for the forthcoming 2016 list to be decided in November! 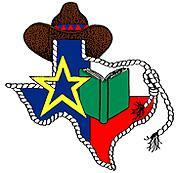 The Texas Lone Star List is a list of 20 current recreational reads for Texas teens in the 6th through 8th grade. The Lone Star Committee is made up of 10 Texas librarians, one of which being me, the Teen Services Librarian for the Smith Library! Murphy Middle Schools library and English departments are making a mad dash to read all of the nominees by November 14th 2015, the date chosen for the Lone Star Committee to deliberate and choose the 2016 list. Thus far, the nominee list is totaling at 81 titles! Stay tuned to read the thoughts of real, live Texas teens on the Lone Star Nominations, as well as mine. This entry was posted in Murphy Middle School, outreach, Texas Lone Star List 2016. Bookmark the permalink.